Jenna knew she wasn’t going to make it home that night. She had decided to make a day trip out to her parents’ house to visit, get a haircut, maybe pawn off the children. But, she started to get The Sickness. The one that her kids have dramatically been suffering from for tedious minute after tedious minute for days upon freaking days. So, when 6:30 rolled around and she found herself falling asleep in her dad’s favorite tv-watchin’ spot while soothing a sore throat, she knew it was all over. That hour drive back to her house was not happening. She called Mike and let him know that he had the all clear to play video games at full volume without his old-lady complaining about the racket. He acted very disappointed, bless his heart. Then, Jenna decided to call it a night so she could get ahead of this virus. And God laughed a hearty laugh. First Ellen went to bed, and things were looking up. The two-year-old didn’t put up a fight, and Jenna thought she might get a solid sleep in. But Sam. Oh Sam. Sam had never been sick before. He is new to this world, and to him, the sniffles are suitable cause for watching the world burn. Jenna tried it all: sit down, stand up, rock, nurse, white noise, Tylenol, lay on ground, lay on bed, lay in carseat, lay in crib, lay the frack down. But, nothing. It wasn’t until Sam was sufficiently cried out that Jenna was able to climb in bed. It was midnight, and she was ready to sleep. No sooner did she climb under the covers did Sam pop back up. And, of course, since Jenna is sometimes a good mom, she popped back up with the little cherub. They played this game until two in the morning, and the mother and son finally dreamed a dream. What seemed like 15 minutes later (and, if we’re not being dramatic – which we are – was actually two hours later), Jenna heard a knock at her childhood bedroom door. It was her mom, and she was bearing a gift. It was Ellen, awake and ready to play. “I can’t do this anymore. She is crazy,” Jenna’s mom said. And, with no energy to respond, Jenna grunted and took the toddler into her bed. Ellen chatted and danced and thrashed and jumped until Jenna finally said, “Lay down and close your eyes or I will put you in the Pack-n-Play all by yourself for the rest of the night.” Eyes closed. Toddler asleep. “Nothing a little threat can’t fix,” she thought. Then, because life is not fair, Sam decided it was time to feast. He awoke with crocodile tears and the screeches of a thousand owls, and he woke his sister up along with him. This hilarious back and forth went on for another hour or so until the three were able to coordinate their Zzzs. If the dear reader is calculating things, the reader would know that it was soon time to wake for the day. All Jenna wanted to do was get back home and change into clean clothes, which she was finally able to do…at three in the afternoon. Now, there is something about carseats that when a child is inserted, said child hates life and will vocalize those feelings. Jenna’s children are no different. So, she headed over to Tim Horton’s for a hot chocolate to sip while her children wrote the lyrics to all the screamo songs. Filled up on chocolate and sugar, she could surely handle this ride. Just as she thought, the kids finally cried themselves into a nap, and Jenna was finally able to crank up the Ja Rule like a d-d-d-d-drummer chick. Things were no better once she got home, but Jenna knew that Mike would be home on time that night and there was one glass of chardonnay left in the fridge. And, despite their wicked bad attitudes, she knew her kids were pretty damn cute. Good thing. Jenna is joining Kelly who also likes to write in third person. Filed Under: Livin' the Dream, Muddahood, You Know? No doubt you’ve seen some of Queenie Liao’s photography. She takes advantage of her baby’s naptime differently than most moms. Instead of reading a book or doing the dishes, Queenie is busy creating a whimsical dream world for her child which she captures in her photography. Check it out. Kristen is a SAHM from Pennsylvania. Quinn is their 4th child and 1st boy! You see, I spend a lot of time during the day thinking that I am not doing enough for the house, enough for the kids, enough for myself and so on and so on. I think other moms must certainly be doing much more productive things with their lives. Other moms would never let their kids watch this much tv. Other moms aren’t as lazy as me. You get the idea. And, if we are being honest here, I still do think those things. But, after doing a photo 365 project, I am starting to realize that I do a lot. In one short year, we have done a lot of really fun things. And, even with all of that fun, I have managed to cook dinner and keep a house fairly clean. That’s not so bad. Filed Under: Livin' the Dream, You Know? You *might* know our family just made the big move from Minnesota back to the great mitten state of Michigan after being gone for a whole year. Mike and I both lived in Michigan most to all of our lives, but darn it if I know anything about family fun around here. Minnesota though? Minnesota is where our gal started to really get into children’s activities, and I know a whole heck of a lot about kid-friendly fun there. So, what are our favorite kid activities around those parts? Check out my guest post at Mom-Spot.com to find out. The suspense! How would you spend your last few days in MN? 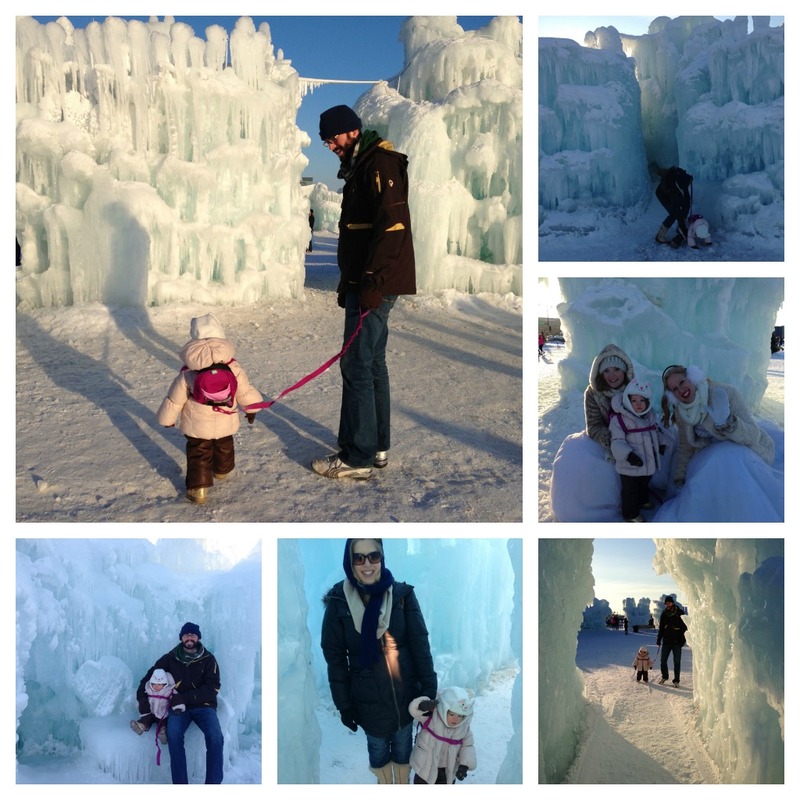 By going to a castle made entirely of ice, of course. It’s what we do in the winter. And yes, we keep our kid on a leash. Can You See My Bathing Suit? So, I tried on my bathing suit for the first time since having Ellen. I’m not going to complain. It wasn’t that bad. Just a little side spillage. I will no longer be baring my midriff in a swim suit. I don’t want anyone to be concerned that I may have been mauled by a tiger. I have not. I will be wearing something a bit more full coverage, but I refuse to look a fool. No no. Instead, I plan on wearing this. Hello $15 at Walmart! I am pretty happy with it. 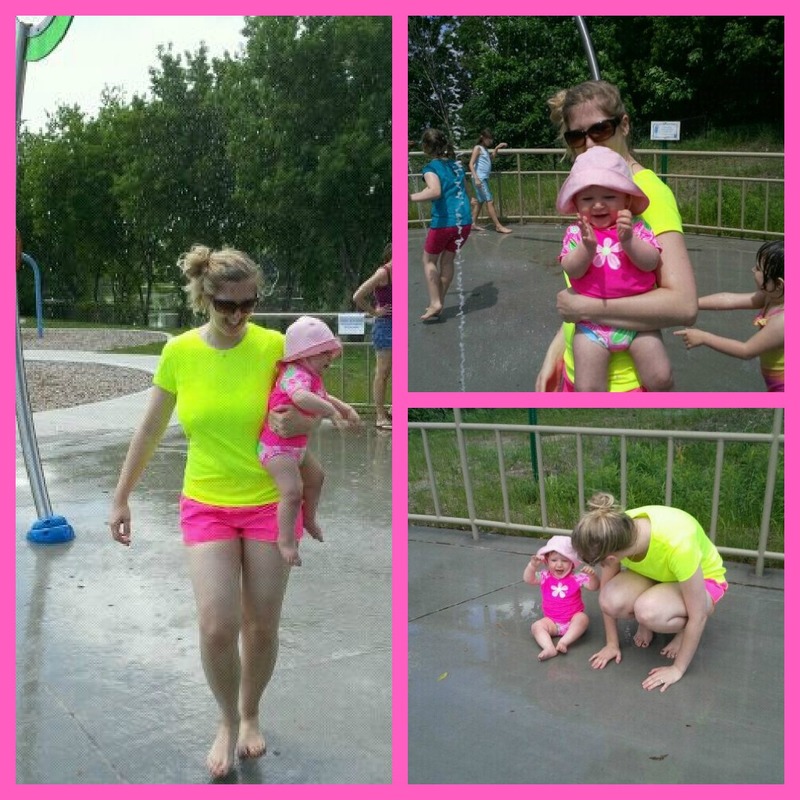 Ellen, Mike, mi madre and I enjoyed Memorial Day at the splash pad complete with picnic, swinging, Frisbee and bubbles. Ellen had a hard time keeping track of where I was. Not. This post is part of the extraordinary-ordinary link up!